I’m on record as being sceptical of fashionable designer yoga. That includes anything to do with chic and glitzy yoga centres. 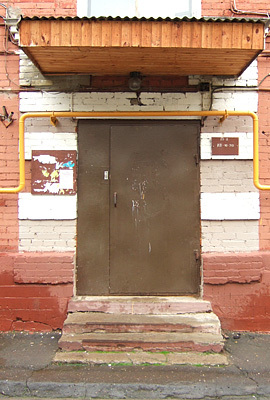 The Ashtanga Yoga Centre in Moscow, as you can plainly see, isn’t one. I thoroughly enjoyed Ilya Zhuravlev’s class there a couple of weeks ago. Recommended for anybody who happens to be in town. Not for non-Russian-speaking beginners; but if you already have a practice and know the sanskrit names of asanas, and can work out the Russian for left and right, hand and foot (this takes at most half an hour to master), then you’ll be fine. And if you do get lost, well, having an excuse to look at the beautiful Russian yoginis either side of you every now and again does no harm at all. Ilya is the editor of yogamagazine.ru (English-language version coming soon, he says, maybe), who published a translation of parts of my Mysore Diary in their issue dedicated to Pattabhi Jois. And having met him and some of his friends, and seen just how dedicated and serious they are in their mission to bring authentic and serious yoga information to their country, it’s all the more an honour and a pleasure to have spent time in their company, both in writing and now in person. I’ll be back.